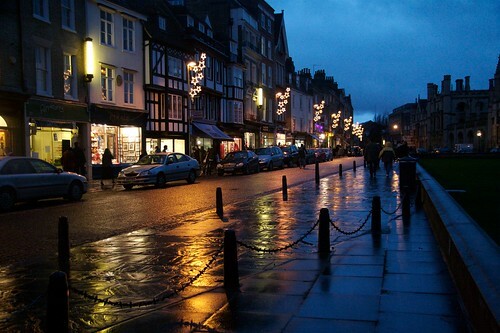 Quentin took this fine picture of Kings Parade in Cambridge. Which had me thinking about the current state of street lighting on Kings Parade. Especially after Cathy and I visited the Shire Hall a few years ago to complain about the new columns. A bit of history first, In 1957 the new Richardson lights were installed, These were custom designed for the City of Cambridge by Sir Albert Richardson and custom-made by REVO some 64 columns and 26 wall mounted candles were made, Trinity street is still illuminated solely by them and they give the city a unique presence at night. However, our council decided that Kings Parade needed improving! The key starting point was the Cambridge Lighting Strategy document which arose out of a consultation session in1997. This began the investigation of possible street scape & lighting improvements for King’s Parade. Minutes of a 25th October 2007 meeting show the lights still to be on the agenda with Cllr Holland asking questions. I await to see what the council decide to waste our money on. IMHO I would just remove the ugly steel columns and leave the candles in, I would imagine they could easily be refurbished. I bet that they do not have lights like this in Dubai! I have always felt safe at night on King’s Parade but I guess that the civil servants have to find something to do some of the time! I agree about a petition – I will email Cllr Holland today and see about getting the steel columns switched off! Philip – Dubai is a land of stark contrasts from total darkness to places where you are confused as to whether it is still daytime! If you think Cambridge is bad for street lighting you should try having to live in a village……..